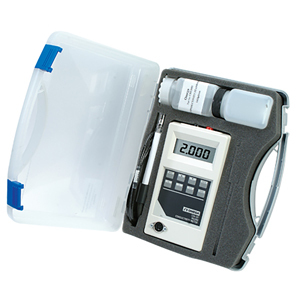 The CDH-287 is a portable, multi-ranging conductivity meter with unsurpassed accuracy and reliability in the field. It also measures resistivity, total dissolved solids and practical salinity, making the CDH-287 the most versatile meter on the market. It comes with a glass, dip-style conductivity probe with an integral temperature sensor and cell constant of 1.0. This microprocessor-based conductivity meter features auto-ranging, programmable temperature coefficient and error diagnostics. Simply pressing the keypad switches from conductivity to TDS, resistivity or salinity units. A concentration mode allows operators to choose their own concentration units and create a specific calibration curve, by measuring up to four concentration standards and inputting the values. To increase range accuracy, cells are also available with constants of K=0.1 and K=10. Dip cells and flow cells are available in both glass and epoxy body styles. 참고: CDH-287-KIT is supplied with meter, glass dip-style conductivity probe with integral temperature sensor and cell constant of 1.0, sample bottle, calibration solution, rugged carrying case and complete operator’s manual.